In 1920 there were over 100 car manufactures in the US. It came to a bubble, 10 years later only 3 companies survived. The same happened in the 1960s with the electronic industry and in the 2000s with the internet companies. He speaks about the “Nifty Fifty” and that investors paid any price for good business in the 1950s. At the end of the day the valuation collapsed and the stocks wend down by 75-90% (featured it in “the mosaic theory as well). According to Pabrai we are currently seeing the “Nifty-Fifty” again. He mentions Amazon, Tesla, Solar Valley, Uber etc. all are good businesses but are valued way to high. Even the CEO of Netflix says that his stock valuation is crazy. He compares Tesla with GM, which is currently trading at an P/E of 4x according to him. He then compares Netflix vs. Micron: Only 3 players in the market of Micron. Micron has a market cap of just 20 Bn. And makes 3,6 bn earnings. Pabrai has launched his fund in 1999 when he bought everything which had a discarded name. According to him, his current portfolio is quite cheap and he again holds many discarded names. He presents a slide with the number of companies which trade at >100x P/E, we are not yet at the peak of the 2000 internet bubble but close by. But he says that we should stay away from these highly valued stocks as they are no no-brainer. Pabrai thinks that bubbles and bursts are now more frequent and happen somewhere in the world every 3-6 months. He shows his performance: Since inception he has made 14,6% p.a. far away from his old aim of 23%, but still outperforming the index by a wide margin. He also speaks generally about the power of compounding. He shows his 5y track record which is with 13,9% below the index (20,6%). But Pabrai doesn’t see a problem with this, as times of underperformance have to be there in accordance to outperform a market over the long run. According to him, the performance will turn around. In the last 2 month the fund lost 12% . He then starts to talk about positions, this year he makes an exemption of his rule not to speak about current holdings. Fiat & GM make up ~ 50% of the Portfolio. He doesn’t invest more than 10% into one position but doesn’t mind when a position grows. The value of the Ferrari spinoff will exceed the initial purchase price of the entire position. In his opinion Fiat will not drop that much after Ferrari is spinout of Fiat. He thinks that Fiat should be at least valued 2x or even more. GM class B warrents will participate from the share repurchase program which will be enhanced further in the future. 85% of mutual funds underperform the index due to the low fees. Pabrai funds runs at ultra-low costs, currently he has costs of 0.08-0.04%. This is due to the fact that he pays for everything like rent personally. He mentioned that UBS is the broker for the fund and helps to achieve those low costs. Pabrai uses a compounding hurdle rate of 6% p.a., which is set on the peak of the fund in 2007. Since than he hasn’t earned any money. If he had charged a 2/20 rate he would have earned +14 Mio., each year!!! Helps to make your decisions visible and improves your process. He bought it at a 0,5x TBV after Buffett went into the stock. TBV (tangible Book Value) is the only metric which is appropriate for a bank investment, but you need a good management! TBV is affected by ROE/ROA. A bank like BoA should trade at a premium x1.4 TBV. Currently we can see a consolidation in the banking sector, due to the higher pressure form regulation. Accordingly, we see a disadvantage for smaller banks (he had a position in Interactive Brokers but sold out). The good thing in investing is that you can make a lot of mistakes in investing but you have to learn from them! They use Puerto Rico as a base due to low costs and low taxes (only 4% tax rate), furthermore he has outsourced the IT of Stonetrust to india which is much cheaper (1/3 of the costs). 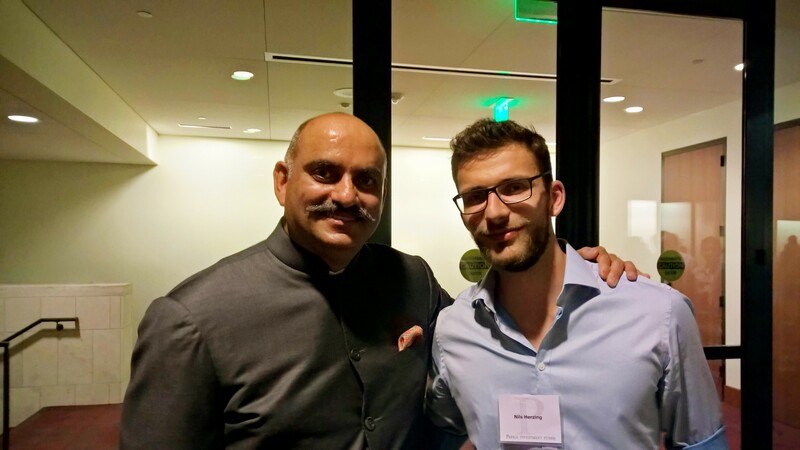 According to Mr. Pabrai, the new ventures have a low downside in terms of capital and a high potential upside. Unfortunately, I was not able to write down the questions in the Q&A as I had to stand in a line to ask my question. That’s it for now! The Dhando investor meeting 2015 was a great experience. I met great people and think I have learned valuable lessons. Was thete any discussion on zinc? there was a lively discussion about his Horsehead Holding, and the CFO of Horsehead was in the room and answered two questions but I was not able to write them down. Did he provide any insight about his position in Horsehead Holding Corporation (ZINC)? no he only disucssed one of his current holdings (Fiat Chrysler). did he talk about his holdings in India? no Mr. Pabrai has not talked about his Indian Holdings. He only mentioned his new IT-Department which will outsource some tasks of StoneTrust. Thanks a lot for sharing Monish’s thoughts !